LIFEPLUS MOD3™ – Mountain Power, Inc.
Join the modular charging revolution with the new LIFEPLUS® MOD3 charger – the latest innovation of high-frequency switch-mode IONIC smart chargers from HAWKER®, the world leader in high-frequency charging technology. Patented LIFEPLUS® chargers are the result of more than 30 years of high-frequency, smart charging experience. LIFEPLUS® MOD3 chargers provide multiple charge profiles, peak efficiency, and non-stop power while reducing charging costs. Combining HAWKER®’s LIFEPLUS® charging heritage with the advantages of modular technology, LIFEPLUS® MOD3 chargers deliver a variety of benefits to enhance your operation. •Energy Savings – LIFEPLUS® MOD3 technology offers the highest conversion efficiency and power factor available in the industry – significantly reducing electrical consumption and demand charges. The LIFEPLUS® MOD3 operates at efficiencies of up to 94% and a power factor of .96. •Plug-and-Play Flexibility – The LIFEPLUS® MOD3 responds dynamically to charge a wide range of battery voltages and capacities without user intervention. LIFEPLUS® is the easiest high-frequency switch-mode charger in the industry to operate. On-site programming capabilities allow the charger to be custom tailored to the application’s specific needs. •Advanced Data Management – The chargers communicate wirelessly with the Battery Boss® WC (BBWC) and maintain a data history of numerous charge parameters for easy analysis and optimization. Optional Ethernet interface provides network connectivity for remote monitoring and data collection. •Opportunity Charging – The LIFEPLUS® MOD3 includes a distinct opportunity charge profile which returns capacity to the battery during breaks without excessively gassing the battery. The opportunity profile can be set either manually using front panel menus or automatically using HAWKER®’s BBWC. The chart below depicts the three phases of the IONIC profile. Vertical lines identify pulses. Every module in the HAWKER® LIFEPLUS® MOD3 chargers are stand-alone, eliminating the risk of catastrophic failures and downtime. •Extended Battery Warranty – The IONIC charge profile delivers an optimal charge with less heat which extends battery life. POWERLINE™ and ENERGY-PLUS™ batteries charged only in this profile will be warranted for 6-years or 1,800 cycles – saving up to an additional 20% life on your battery investment. 1. IONIC – This patented, exclusive profile is the preferred choice for most applications. Employing periodic current pulses which both identify the battery’s true capacity and state of charge, as well as mix the electrolyte throughout charge to avoid acid stratification. This profile provides the optimal recharge with minimal heating. 2. Cold Storage – The LIFEPLUS® MOD3 charger series will automatically switch to the cold storage profile if the battery temperature is below 59ºF. 3. ENVIROLINK™ – The LIFEPLUS® MOD3 charger comes standard with a profile specifically for the HAWKER® ENVIROLINK™ valve-regulated batteries, as well as the industry-standard gel batteries. 4. TPPL – Allows for fast or opportunity charging of Thin Plate Pure Lead batteries. 5. Opportunity – The charger current is up to a 25% start rate depending on battery and charger size. The opportunity profile may be used with or without a BBWC. When employing a BBWC, the charger will change profiles based on the BBWC’s settings. Without a BBWC, you must program the charger in opportunity charge mode. 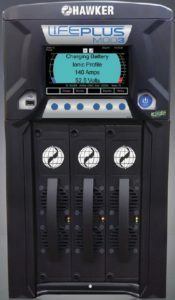 Equalize and complete charge time parameters must be programmed through the charger configuration screen. 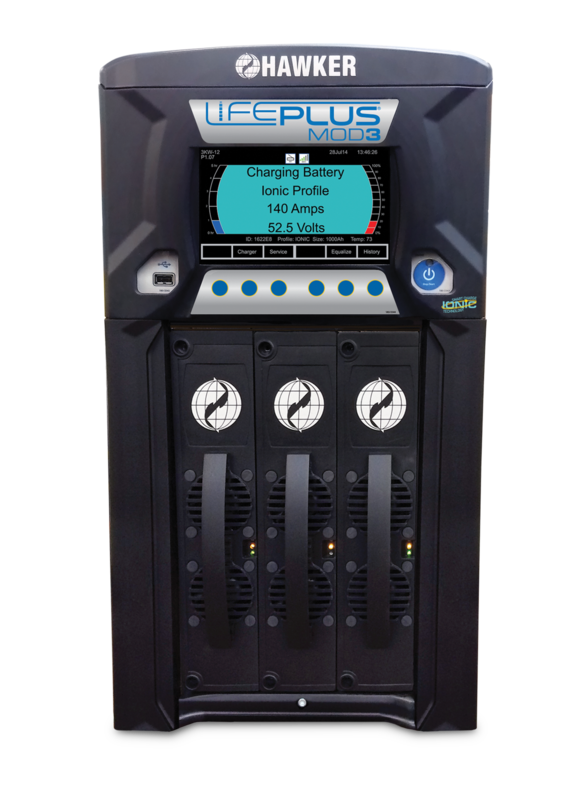 Power You Can Count On – The new high-frequency modular LIFEPLUS® MOD3 charger supplies dependable, proven power – delivering maximum reliability and improved efficiency to keep you moving. Flexible. Adaptable. Fast. – The modules in HAWKER®’s chargers automatically adjust to effectively charge the battery while maintaining optimal efficiency and best power factor. 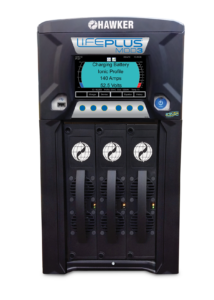 The modular design of the LIFEPLUS® MOD3 allows for adaptation to a variety of battery capacities, potentially reducing or eliminating the need for more chargers in your fleet. Eliminate Downtime – When employing two to six individual power modules, LIFEPLUS® MOD3 chargers provide you with a non-stop charge. Even if one module stops working, the rest will keep working to continue charging the battery – making downtime a thing of the past. Simplified Service – The LIFEPLUS® MOD3 self-diagnostics feature alerts operators to any possible failures. Replacement modules are available for quick delivery, and because of their design, installation is fast and simple. Scalability for Future Needs – Our modular charger design offers the advantage of scalability. 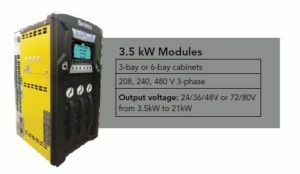 The 3-bay and 6-bay LIFEPLUS® MOD3 charger cabinets allow modules to be added in response to changing power needs. 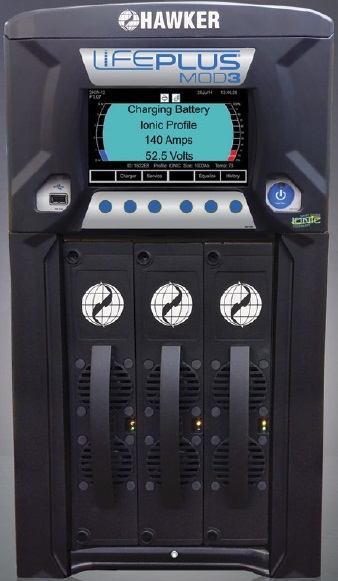 Your current operations may require only a few modules to effectively charge your batteries, but if your workload changes (or if you switch to opportunity charging), these larger cabinets can quickly accommodate additional modules to meet your expanded power requirements. Environmentally Engineered – The HAWKER® LIFEPLUS® MOD3 chargers consume less electricity, simultaneously reducing battery recharge costs while positively impacting our carbon footprint. The modules in the HAWKER® LIFEPLUS® MOD3 chargers work as a team to deliver consistent power. Even if one module goes down, the other modules will continue charging. LIFEPLUS® MOD3 chargers are the smartest and most energy-efficient chargers in the business. The LIFEPLUS® MOD3 charger series reduces your battery recharge costs, reduces water consumption, and reduces battery maintenance and repair costs. ENERGY SAVINGS – LIFEPLUS® MOD3’s IONIC charge profile lowers charge factor by diagnosing the battery and precisely returning the energy needed to completely charge your battery. The IONIC profile coupled with high electrical efficiency can offer significant savings on electrical costs. MAINTENANCE SAVINGS – With the LIFEPLUS® charger IONIC technology and lower charge factor, you will spend at least 25% less time and less money watering your batteries, when charging in IONIC mode. BATTERY SAVINGS – LIFEPLUS® MOD3 chargers can extend the life of your battery fleet by a minimum of 20%. Less heat generation during recharge means longer battery life, less downtime, and less money spent on battery repairs and replacements. OBSOLESCENCE SAVINGS – LIFEPLUS® MOD3’s flexibility and scalability means that your chargers may not need to be replaced when your present trucks or batteries are replaced.